My name is V.58 Pristiophoridae. You can call me V.58, like Johnny 5. You know- from Short Circuit? 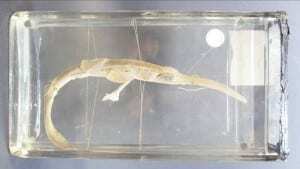 Anyway, I’m a sawshark. 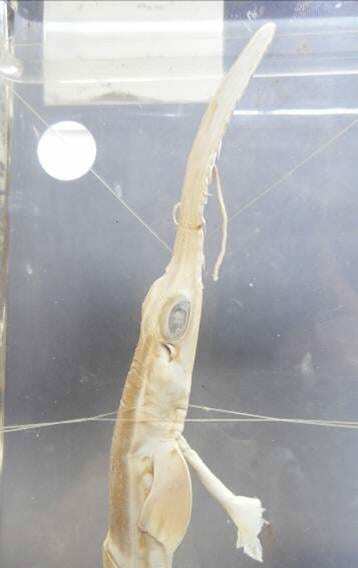 Not a sawfish, no no, a sawshark. My head is separate from my pectoral fins and I have a moustache half way down my snout. That’s how you can tell. I can’t put a photo up here of my friends in the wild because they are so rare and I can’t afford to pay royalties to the people who have any. If you do an internet search, 98% of what you’ll be looking at will be sawfish. I live at the Grant Museum of Zoology in London. I like my home, it’s not that I don’t, but you see, I don’t have anyone to love me. I am only a baby, I’m just an embryo actually, and I’m an orphan. I can’t remember my mummy or daddy, but I need one now. I’m lonely. I have some friends, a few sharks, a few boney fish, but no family. Many of my friends have a foster parent, but not me. I don’t understand why, because I am really, very cute. I feel so alone. I know there are lots of species of shark but I am special, really, I am. I am really, REALLY rare in the wild. My friends and family were all killed for our uber amazingly cool noses which have ‘teeth’ all along each side. They’re not really teeth, they’re special scales. I’m even rare at the Grant Museum, I am the only sawshark they have. You see how special I am? And yet no-one will love me. Sob. It only costs £15 to adopt me, for a whole year. That’s about two pints of beer in London isn’t it? You get a few other things too for your money, not just me. As if I wasn’t enough? Just £15 to make me feel loved and wanted and to give me what I dream of… a small blue card with a name on it to display proudly in front of my tank. The name of someone who loves me. Will anybody love me? Pleeeaaaase? Please love me? Your plea has moved me and I would like to adpot you – I think it’s mainly because of the moustache half way down your snout. What do I need to do next? I AM SO HAPPY!!!!! If I had tear ducts I would cry! Thank you so much, you just wait until I tell my friends, they are going to be so thrilled for me! Finally I have a family all of my own. You won’t regret it, I am going to be the BEST sawshark you ever adopted! I have a really good friend at the museum called Emma and she would be delighted to meet you and make it official if you can pop in? Then you can also meet me face to face which I am really looking forward to! I am off to comb my moustache before you arrive, I want to look my best. I would love to come and meet you – would Tuesday afternoon be suitable? Would comb my moustache too if I had one. Of COURSE!! That would be absolutely wonderful! I am so excited to meet you! Have a very lovely evening, I’m going to go to bed early so tomorrow will come sooner! I am afraid that my good friend Emma, who was SO looking forward to meeting you today, is very sick and as much as it pains her (she’s very dedicated!) she is having to stay home in bed today. However, luckily for me I also have another friend at the museum called Mark and he is very much looking forward to introducing us later instead. I’m sure Emma will be back in tomorrow if you’d rather wait, otherwise Mark and I will see you later! P.S. Emma sends profuse apologies! It was marvellous to meet you and I hope your friend Emma feels better. Dear MY very own foster mum! Thank you SOOOOOO much for officially becoming my parent, I am such a lucky sawshark, I was tickled pink when you were drawing me! After years of wishing, I finally have my very own magical blue card in front of my tank! If ever I feel lonely again I will just look at it and think of you! I will never feel sad again! I’m looking forward to your next visit!